About : Recently our neighbours, Cosmo China, celebrated their 20th anniversary with an exhibition of special hand painted plates by some of their artists and friends. Proboscis helped them put together a simple book showing all the plates with biographical details of each of the artists. Co-owner of Cosmo and artist, Josie Firmin, painted the picture on the front cover. PPOD copies of this book will be available to buy in the shop from early August. 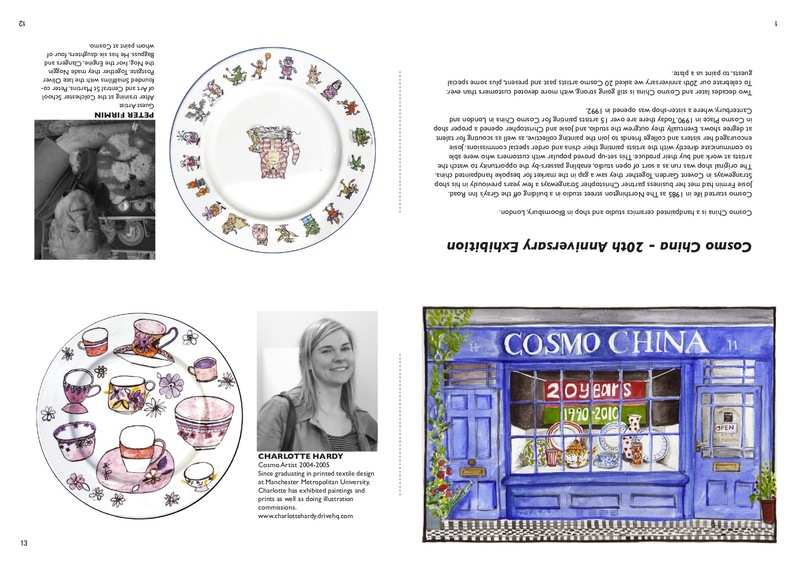 Cosmo China is a handpainted ceramics studio and shop in Bloomsbury London. The shop was opened in 1990 by Josie Firmin & Christopher Strangeways, and a second shop was opened in Canterbury, Kent in 1992. There are currently over 15 artists painting for Cosmo in both shops.